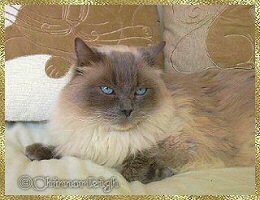 Presley was my first Ragdoll & is to blame for my Raggie addiction. He is a big softy & loves his cuddles, he is a proper mummy's boy. Presley likes to sit on the window sill watching the world go by & if he should spot a bird in the tree's his eyes widen & he will chirrup along as though he is talking to them. Presley also loves to have a shower & will quite happily join anyone in the shower room. As Presley is neutered he can live happily indoors with all the girls, though he does not like it when the girls are calling & tends to tell them off if they become too noisy, anything for a quiet life, lol. Many thanks to Anne for this very loving boy. 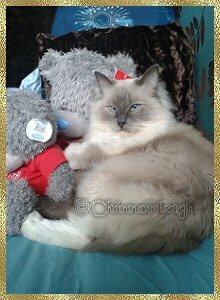 Well, what can I say about our very special Daisy baby......., she is a blue mitted Ragdoll & is fondly known at home (& by her breeder) as 'mad cat.' Daisy is full of character & is as mad as a hatter!!! She doesn't walk but charges everywhere she goes! Where ever there is trouble you will find Daisy right in the middle of it. She loves to stalk all the other cats (especially Freckles) & puts the fear of God into them!!! Having said all that Daisy can also be very affectionate & loves to be in your face, she will happily come & cuddle up with anyone. Daisy is a daddy's girl & goes 'crazy' when she hears my husband returning home from work. She loves to hang around his neck when he's walking around & loves to sleep on his chest at night - much to his discomfort. Daisy is also very talkative & loves to chat to everyone, she always has a story to tell! Her favourite game is to play 'fetch' with my daughters hair bobbles. She chases them around the house & always brings them back to you & drops them by your feet waiting anxiously for you to flick them again. Sadly 'Motherhood' wasn't too kind to Daisy, after her first & only litter of five beautiful babies & after recovering from a short illness we made the decision to have Daisy neutered. due to her bravery & remarkable recovery from a severe bout of mastitis." Daisy really is our very special girl. couldn't have done it without you, thank you. Rocksy is the full sister to Lilly & Freckles but from a later litter but the genes are there, as just like her sisters', Rocksy is another big girl & is also very, very loving. She weighs just a little more than Freckles, has excellent boning, very good eye colour & a beautiful thick, soft, silky coat to match. 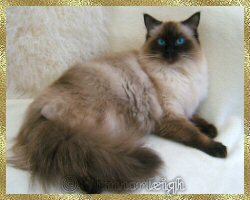 She has excellent type & has an excellent temperament, just how the Ragdoll should be!! Rocksy is another 'mummy's' girl & like Lilly & Freckles follows me like a shadow. Housework really is a hard task when you have Raggies around, especially when you have Lilly, Freckles, Rocksy & Teddy!!! Rocksy loves to have her tummy rubbed & will flop & roll around the floor hoping that you will oblige, lol. She also loves to have her paw pads rubbed & will happily lie on her back with her feet up in the air whilst you rub her paw pads, she really is a strange Raggie!!! Her favourite toy is her crinkle ball that she carries around in her mouth all day long. Rocksy is very chatty & will talk all day long!! !